Made from easy to digest goat milk - Enhanced according to the latest nutritional insights - Blessed with a deliciously mild taste - Naturally easy to digest goat milk - Relative high levels of short and medium chain fatty acids; Smaller fat globules; Softer coagulate in the stomach - Adapted Protein composition - Enriched with DHA & AA, Probiotic GOS & FOS and DigestX fatblend - Mild and creamy taste. Stage 1 : 0 -6 months Produced in Holland with high quality goats milk in a purpose built facility. 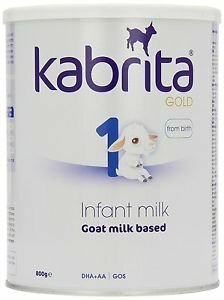 If you have any questions about this product by Kabrita, contact us by completing and submitting the form below. If you are looking for a specif part number, please include it with your message.